Wild parakeet populations are expanding in many European cities, where they enjoy the relative warmth of dense urban settings and have easy access to food. LAUSANNE — Walking in some large European cities, it can be surprising to see swarms of birds with unusual colors and emitting shrill noises. The exotic creatures look and sound decidedly out of place — because they are. They're tropical parakeets! And yet they're happy and thriving, with populations in some urban cores in the hundreds or even thousands. 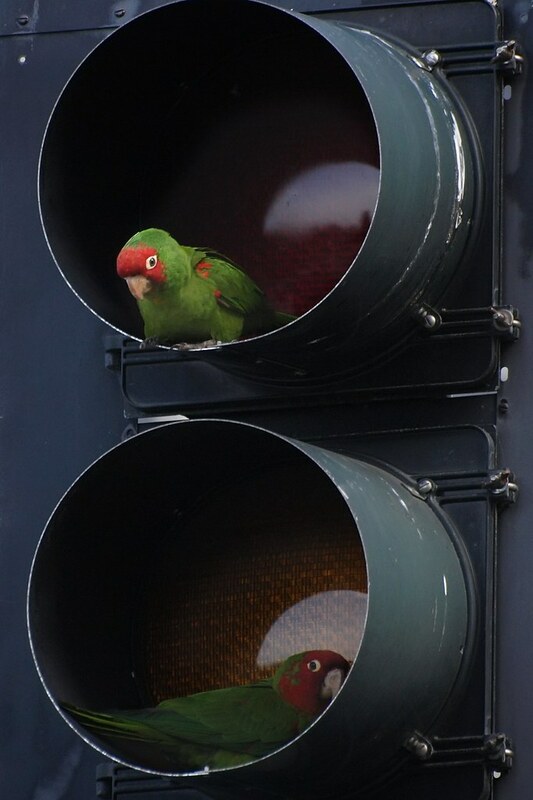 The European monitoring platform ParrotNet identified more than 50,000 parakeets in London, around 12,000 in Brussels, 1,500 in Amsterdam's city center and 1,000 in Madrid. The birds belong to the parrot family, with two particular species predominant in Europe: the rose-ringed parakeet and the monk parakeet. While these birds seem to enjoy themselves here, they actually come from other latitudes. The rose-ringed parakeet is usually found in the tropical zones of the African and Asian continents. The monk parakeet comes from Latin America. So how did these exotic birds come to colonize the Old Continent? And why are there so many of them? Blame humans, and their taste for caged birds. Parakeets are thought to have first taken root in Europe in the 1970s after being released either intentionally or by accident. In 1974, for instance, a zoo in Brussels released some 40 rose-ringed parakeets. That same year, at the Paris Orly Airport in France, approximately 50 parakeets escaped from a container. Something similar happened in 1990, this time at the Paris Charles de Gaulle Airport. Since then, parakeet populations have grown steadily. The mild climate of Western Europe's coastal countries — especially in England and the Netherlands — enabled the tropical birds to survive. And to survive cold winters, parakeets rely on food that generous inhabitants put in feeders. Once free, these parakeets became city dwellers. Cities, with their densely packed buildings, tend to be a bit warmer than outlying areas. Predators are rare. And food — in the form of scraps left by people, or the ornamental plants found in many urban parks — is readily available. When mating season comes, rose-ringed parakeets search for holes in trees or old walls to build their nests. But as the number of these holes is limited, birds compete against each other ­ — especially against sparrows, starlings, nuthatches and chickadees that also use these cavities. In these street fights, parakeets are usually the winners as they have two important advantages: size and numbers. "They're slightly larger than rival birds," says Daniel Cherix, honorary professor at the University of Lausanne's Department of Ecology and Evolution. "But their main characteristic is that they travel and nest in groups. So parakeets benefit from greater numbers." That also explains the invasive nature of the species. They have both food and shelter; thus they can easily breed and slowly take over the native species. But should we necessarily be worried about the arrival and spread of these colorful birds? Professor Cherix says the arrival of a new species isn't, in itself, a problem. "We have to remember that all existing species were once 'invasive,'" he says. "In the case of parakeets, what could be a problem environmentally speaking is that they arrived so suddenly. Local species didn't get enough time to adapt and specialize themselves in an ecological niche." As such, local birds may face the risk of extinction. Ornithologist Laurent Valloton, who works at the Museum of Natural History of Geneva, thinks that for now, at least, the threat is only to certain already-rare bird and bat species. But continued vigilance is certainly needed, he says. In cities where parakeet populations have grown to significant numbers, the birds are spreading into the outskirts in search of new spaces. That can spell problems for suburban fields and orchards. In their native continents, parakeets that attack crops can be a real nuisance. In India, for example, swarms of parakeets have been known to wreak havoc on grain fields, and on lemon and plum trees. The economic losses, in such cases, can be considerable. "In Europe, the cost of invasive species as a whole is estimated at 12 billion euros a year," says Daniel Cherix. "This figure takes into account the ecological, economical and medical aspect." Medical issues come into play with species like tiger mosquitoes, which are native to Southeast Asia and can transmit diseases such as yellow fever and dengue. For all of the reasons above, it's important to halt the spread of certain problematic species. But how? Luis Manso, who works in Zaragoza, Spain, with the city's Environmental Protection Unit, says one technique they tried on monk parakeets was to pierce the birds' eggs, but then leave the eggs in the nests to trick the parents. The method proved, however, to be inefficient, prompting the city to take a more direct approach: shooting the birds. Other cities have tried non-lethal methods, like sterilization and trapping them with nets, but with little success. Of course as time goes on, we're likely to take these birds for granted. What once seemed exotic will be commonplace — like swans. Few people recall that swans are also an imported species. "Swans came from Asia and were introduced in Switzerland as an ornamental bird in the 19th century," says Laurent Vallotton. Nowadays it's hard to imagine the Lake Geneva region without them.